The NetCDF data used to initialize SeaRISE runs is freely-available online. The script preprocess.sh requires wget and also the NetCDF Operators. It downloads the version 1.1 of the SeaRISE “master” present-day data set, which contains ice thickness and bedrock topography from BEDMAP , and modeled precipitation and surface mass balance rates from RACMO , among other fields. In particular, it creates three new NetCDF files which can be read by PISM. The spatially-varying fields, with adjusted metadata, go in pism_Greenland_5km_v1.1.nc. The other two new files contain famous time-dependent paleo-climate records from ice and seabed cores: pism_dT.nc has the GRIP temperature record  and pism_dSL.nc has the SPECMAP sea level record . Any of these NetCDF files can be viewed with ncview or other NetCDF visualization tools; see Table 25. An application of IDV to the master data set produced Fig. 1, for example. Use ncdump -h to see the metadata and history of the files. Fig. 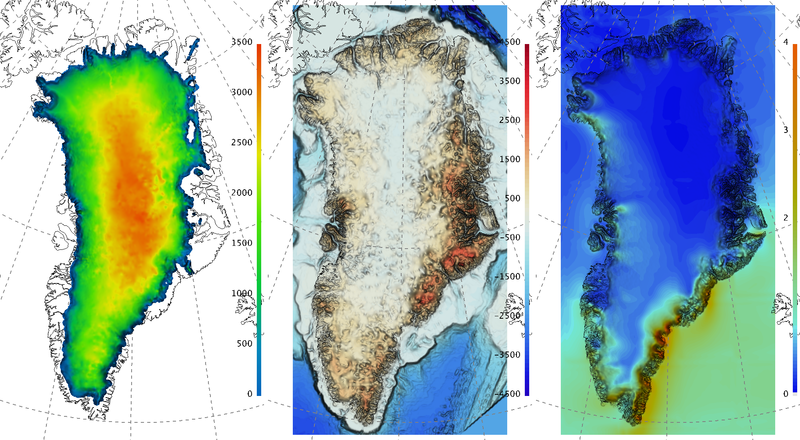 1 The input file contains present-day ice thickness (left; m), bedrock elevation (center; m), and present-day precipitation (right; \(m / year\) ice equivalent) for SeaRISE-Greenland. These are fields thk, topg, and precipitation, respectively, in pism_Greenland_5km_v1.1.nc.